Chevel Shepherd a 16-year-old songstress who has moved into the top 13 last week! The most streamed artist last week! 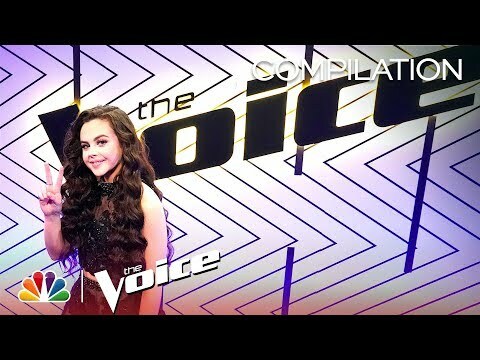 Chevel Shepherd performances The Voice 2018 Season 15 videos. Here is Chevel’s Journey on the show Season 15 in all performances. You can scroll down this page to see individual videos and more specific content. Congratulations to Chevel she won the Season 15 edition of the show! True shock and surprise, then excitement showed all across her face in winning the series tonight. Well done! A worthy winner. Top 4 Announced following the Top 8 performances. Congratulations to Chevel, she advanced into the final! From Team Kelly and very excited as the second announced. Chevel returned for her final performance on the night, an original Broken Hearts (Original song written by Shane McAnally, Ashley Arrison & Aben Eubanks). Kelly and Chevel’s duet…Chevelly named…Rockin’ with the Rhythm of the Rain by The Judds. Chevel came to perform and the production shows her journey along with Kelly enjoying winning her vote at her audition. Kelly talked about her powerhouse country girl and she is coming for country music. It’s a Little Too Late by Tanya Tucker! Chevel Shepherd Blue by LeAnn Rimes. More country from this fighter and young singer. She also got the Brynn Cartelli advice scoop with Kelly and talked about the production of the song. Chevel received a follow from Loretta Lynch during the week to add to her excitement! Not bad for her! Adam loved her, her voice, the music you play and want to watch her next week. Kelly loved her and to keep the style going and make a record. Pitch rush candor. Duets Che-Kirk duet Chevel and Kirk country rock duet called She’s Country, full of a heavy guitar to start, raging cajun foot stomping song. The Top 11 Live Show performance. Results show – revealed she had advanced into the Top 10 this season. Well done Chevel and her fans. Chevel Shepherd – Space Cowboy by Kacey Musgraves, a 16-year-old songstress talked about the support she is receiving now. Kelly believes she is a born storyteller…and produced in a tender rendition to appeal to all her audience. Kelly was excited about the big note and she was so proud, storytelling and loves her.